Though bornÂ inÂ koraput districtÂ of orissa Dhimsa is almostÂ the official dance of Vizag. 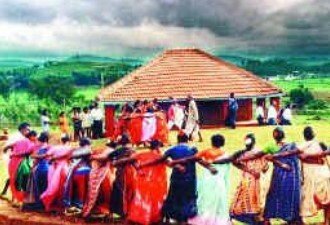 This tribal dance is performed by the Porja' caste (One Of many tribes of eastern ghats) women praising deity for welfare of the domestic life. Nearly 15-20 women form a chain and dance wearing typical tribal dresses and ornaments. The leading women carry a peacock feather in her hand. It is a must for newly wed because on this day the women pray for a peaceful and happy married life. The members play instruments like Mori, Thuduma and Dappu. The simple, haunting, natural way of expression of joy Dhimsa way of dancing can take one to the height of ecstasy since it is not bound by the limitations of classical forms. But the pristine form and traditional approach are giving way to improvisation. Danced to the sonds of the dhol and dhamsa by the male and females of Porja Tribes this dance is supposed to be in honour of dogess of crops. Dhimsa like other tribal dances is lively, colourful and carry the rhythm of their daily lives and labours. Dhimsa has become synonymous with the Culture of this region, especially with places near Araku and Borra Caves, the natural destination for any tourist. Even those who have not visited these two must-see places get an idea of it from the life-like replicas on Beach Road and the dances that fill the air on any important occasion, special cultural programmes. The performance of Dhimsa in natural environs at Jungle Bells, Tyda or during the misty evening before a bonfire at Araku has its own charm. The performances at Araku are amid natural environs and sans the usual rush, with another troup waiting in the wings, afford one a better enjoyment of the dance. The dance with its simple rhythm and the earthy colors of the tribal wear focuses on the movement of the dancers without much emphasis on expression or a literary text. Red, yellow and green are the colours the tribals attire themselves in. Movements of the feet and the hands by the group dominate the dance. With an elemental rhythm and animated, quick steps with manoeuvres resembling the darting of a centipede its raw energy captivates one. One gets the impression that it is the collective performance that matters with each of them complementing the other and merging into a unifying whole. Dhimsa is performed during festivals, weddings and at the time of the "hunting festival" in April when men and women dance for hours together. It is being passed on from generation to generation. Accompanied by wind and percussion instruments, the dance changes by the music, and a troupe comprises 20. There are 12 varieties of Dhimsa and Origin can be traced to the Koraput Area the home to Ghond Tribe. It was a major event at the Dasara and the Rath Yatra celebration at Jeypore during the reign of Vikramadeva Varma, the last Maharaja of Jeypore, who was a great patron of tribal, folk and classical arts. .
9. Boda Dhimsa > Involves worship of their ritual goodness or god in villages. 10. Goddi Beta Dimsa > Dancer moves both backward and forward with the swinging of body. 12. Gunduri Dhimsa > A very charming dance in which male dancers participate with peacock feathers and invites female to participate with them. Porjas are found predominantly in the tribal areas of Vizag district of Andhra Pradesh. Porja tribe is divided into the following endogamous sub-divisions or sub-groups.